It’s week 23 already! Can you believe it?! 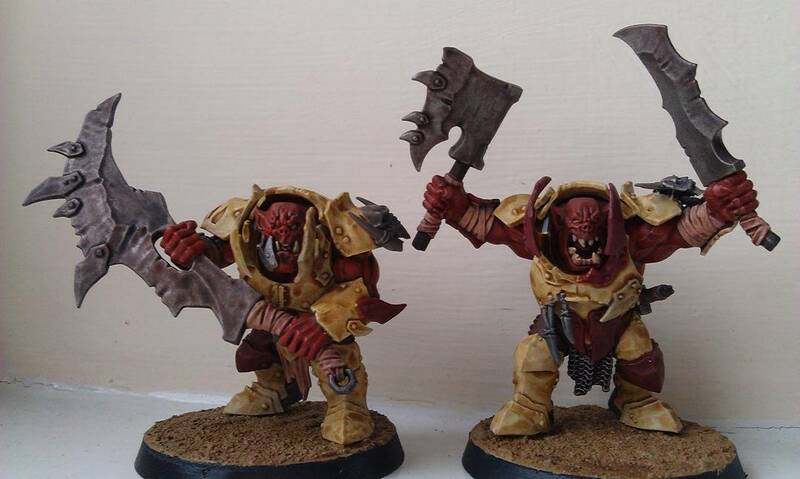 I’ve had another fairly slow week, as I try to get the two Orruks that I’d started last week somewhere near finished. Progress has actually been good, I’m quite impressed with myself at least, so I’m glad to have that to report, anyway! 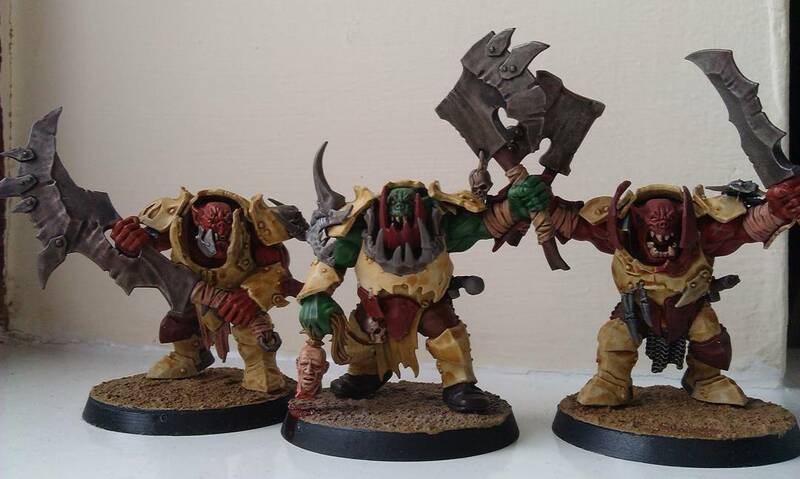 The new chaps were painted red rather than green, as I wanted to try something different, so in my headcanon, the red Orruks are the run-of-the-mill brutes who like to bash stuff up, while the green variety are more cunning and climb to the top of the pile. Hence why my green guy is the brute chief (do they have a name?) and the other two, well, aren’t. These guys’ armour was painted following the Stoneskulls scheme as laid out in the How to Paint Ironjawz book from Games Workshop, and while I’ve probably been more heavy-handed with the sepia shade this time, overall I’m quite pleased with the result. I’ve once again gone for the flayed-skin look to the bandages and wrappings, and the loincloth thing on the one with the big choppa. I think the overall effect is of too much red in the model – and what with the bases and the armour having a similar colour scheme also, it’s led to a fairly narrow palette overall! I quite like the effects on the weapons, though, even if I do say so myself! The wrappings are kislev flesh shaded with a mix of carroburg crimson and agrax earthshade; this shade mix was then used first on the axes to try to simulate dried/old blood. I shaded them lightly with agrax earthshade and then nuln oil to tone it down, but overall it looks nice and grimy – well-used, if you will! I’m toying with the idea of trying some kind of rust effect, but for now I prefer to have less than more. Finally, I’ve built up the last of the models from the box. I said above that it’s quite the narrow palette, and that’s kinda putting me off jumping immediately into doing them, I’m half-thinking I’ll submit them to the next painting competition at my local GW, which is one where you need to paint up an entire unit of Age of Sigmar stuff. I could just put some of my recent Stormcasts there, but I think I’d rather do these guys. It’ll force me to complete the unit of five, at any rate! So stay tuned for that! It’s been a quiet week, then, without a great deal of activity to speak of. I’m pleased to be making progress, of course, but still. Next week will hopefully be very exciting, anyway – and, dare I say, Chaotic…?